I've always wondered whether anything was done with all that brass. No, but I'll bet they just kicked it overboard. Those anti-aircraft cruisers had rapid fire six inch rifles. 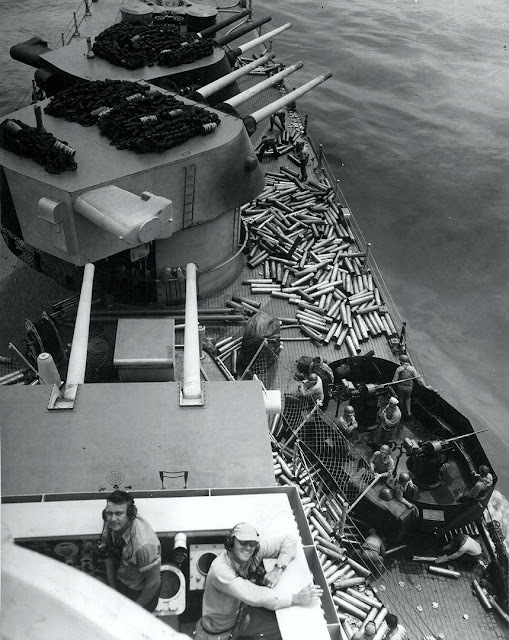 During naval engagements off Guadalcanal, the Japanese reported to the high command that the Americans had machine-gun cruisers because once they had the enemy in their sights, the gunners would close the key and the guns kept firing and firing. Notice the barrels above. The paint was cooked off. I wouldn't want to have been in that machine gun nest- I'd be nervous with all that brass crashing on the deck right next to me, and it might distract my aim!